I've been planning to write about the fantastic food served at the Mexican, Tex-Mex, and BBQ restaurants here in College Station for over a year, but have yet to get my thoughts down on the virtual paper that is this blog. Now that I think about it, I actually have no idea if other people who live in College Station think the Mexican, Tex-Mex, and BBQ options in town are any good. But for this Midwesterner, having even halfway decent food available in these categories is a vast improvement over having no options at all, which was the case in my previous city of residence. 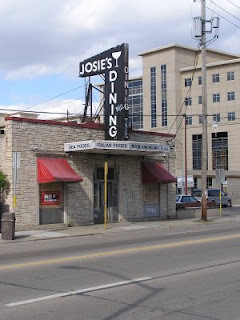 This family-owned and operated neighborhood Italian restaurant - complete with red and white checkered tablecloths, antique candles lighting the dining room, and soft Italian music in the background - served the best spaghetti in the entire world. We would often dine-in after Wisconsin Badger sporting events and carry-out on evenings my mom was working and my dad didn't want to feed us pancakes and popcorn for the THIRD night in a row. When a kitchen fire in 2004 led to the restaurant's closure, the city grieved the loss of a community landmark. I grieved the loss of my spaghetti and meat sauce, and the loss of a Mueller family tradition. Andy's was at one time an A&W, but when franchise expenses rose beyond what the owners were willing to pay, they bailed on the franchise and turned the space into their own hamburger joint. I chose Andy's for every single birthday and special occasion dinner I had coming to me, and my dad would take my sister and I there for dinner when my mom was working and he didn't want to feed us pancakes and popcorn for a FOURTH night in a row. Andy's has since closed - another loss for the Mad City and the Mueller family. After trying every single Chinese food restaurant in Ann Arbor and College Station, Tom and I have reached the conclusion that Taste of China is in a league of its own. 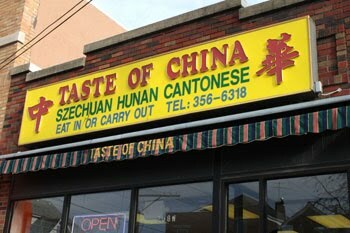 I ate at Taste of China at least once a week while I was in college, often with my wonderful friend and roommate for three years, Beth. She always ordered Sesame Chicken and I always ordered Beef with Broccoli, and then the next day we'd trade leftovers. I miss Taste of China, and I miss Beth. campaign trail at the Hamburg Inn. When Tom was in the home stretch of dissertation writing and basically living in the basement of the Industrial and Operations Engineering Building at the University of Michigan, I would pack up the kids, drive to Panera, pick up dinner for Tom, and then drop it off for him at his office every evening. That's right - we went to Panera every weekday evening for weeks. Those moments, when we dropped off Tom's dinner and the kids hugged and kissed their dad goodnight (Will: does Daddy not live with us anymore? Does Daddy live at work? ), were all that kept the four of us going in the final weeks. And like Pavlov's dogs came to associate a bell with dinnertime, the four of us came to associate Panera with family time. 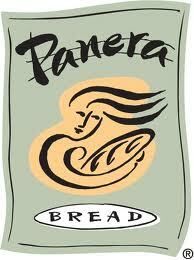 I enjoyed Panera before, but now it holds a particularly warm and comforting place in my heart. And stomach. 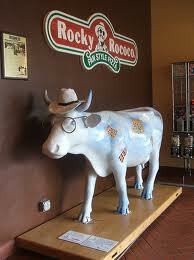 Rocky Rococo restaurants are located in Wisconsin, Minnesota, and Washington (?). I dream about their thick-crust square and rectangular pies, sweet pizza sauce, and chunky, generous toppings every few nights (well maybe not that often, but often enough to mention the fact that my dreams include pizza), and Rocky's pizza is always my first dinner - followed by Greenbush Donuts for dessert, since Rocky's and Greenbush are right next door to one another - when I arrive in Madison. I absolutely can't wait to take Will there now that he can finally eat pizza with cheese on it. 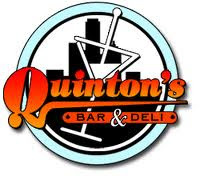 I first walked through the doors of a Quinton's when one opened in Iowa City during my college years. In the beginning I loved Quinton's for their half-price "Big Girl" margaritas offered during FAC (Friday After Class), but as I grew older and less able to consume such large drinks, my focus turned to their food. Specificially their Creamy Potato Bacon Soup in a Bread Bowl. Oh mon dieu. I've tried quite a few times to recreate this mouth-watering bowl of heaven, but have never even come close. Tom and I enjoyed lunch at Quinton's on our Eating Our Way Through Iowa City tour, and while we were a little concerned when we first walked through the door - the joint looked a little rundown and the waitstaff a little bored - the food was as delicious as it's ever been. Note: This post was not sponsored. The opinions expressed in this post are my own, and I was not compensated to write positively about any of the above-mentioned restaurants.